Our project work is diverse and interesting, covering all aspects of landscape and habitat management both in urban and rural contexts. We take great care in ensuring that all our work is carried out to the highest national standards and with the minimum disturbance for animal and plant species already on site. The projects below represent a small selection of our extensive experience which our team has built up over 30 years. The Yarrow Valley site covers an impressive 700 acres in the heart of the beautiful Lancashire countryside. CCNW’s specialist conservation team has extensive experience with all aspects of habitat improvement projects. 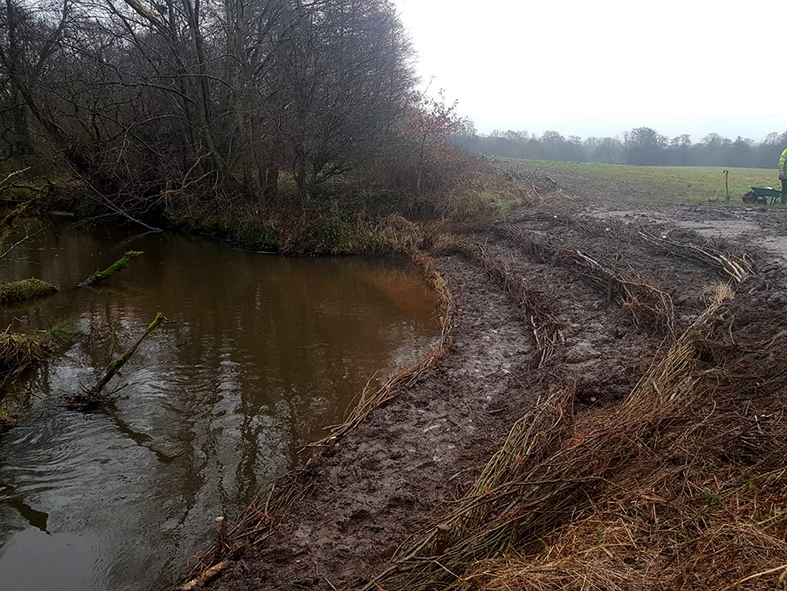 The key aim of the works was to undertake riverbank stabilisation and pond management, providing long-term erosion control, and habitat creation. CCNW undertook the creation of a series of shallow water area scrapes. Utilising these natural depressions water can be retained on the floodplain for longer, creating a unique haven for an ecosystem detached from the main river channel. Reedmace was removed from the pond and replaced with common reed to act as a filter and improve the water quality of the pond for wildlife. During the works, our Site Ecologist was on hand to give advice and provided a number of toolbox talks. Hazel woodland was coppiced as part of a 7-year rotation plan to allow for differential growth. The collected brash was used to form brashmats and provide stabilisation to the riverbank. The banks were planted with native tree/shrub species to stabilise the poached banks and reduce sediment input. Queensway Nature Park in Lytham St Anne’s is part of a much larger Neighbourhood Development Plan which includes creating over 1100 new houses, a school, a farmland conservation area and a new road bypass. The aim of the project is to create a new nature park featuring woodlands, wetlands and hedgerows along with visitor facilities. We planted 17,600 new trees to create an entire new woodland habitat with species including common alder, silver birch, willow, common aspen and English oak. We also planted eight hedgerow species, totalling around 1500 plants. Species included blackthorn, hawthorn and hazel. Once fully mature, the resulting woodland & hedgerow will provide habitats for a variety of species including barn owls, bats, hedgehogs and grey partridge as well as providing visitors with a great day out. Amberswood is a 160 hectare nature reserve and is the focus point of Greenheart, Wigan Council’s network of high quality natural landscapes. The key aim of this project is to re-wet a significant area of mossland and to prevent the inundation of surface water from the surrounding fen. Over several years, the changing hydrology had led to the moss drying out, causing a decrease in plant species such as sphagnum moss and enabling encroachment by bracken & willow scrub. As a starting point, we stripped back the turf and vegetation which was appropriately disposed of. We then undertook the main part of the project. To control drainage flows, we constructed 52 peat plug dams and 11 reinforced dams using plastic piling. Shallow scrapes were dug to create water-based habitats with the waste material being used to build a 610m peat bund wall. The work we undertook will raise the water level, prevent further loss of water and help encourage sphagnum moss regrowth whilst enabling specialist plant species such as bog asphodel, bog orchid & sundew to propagate. South Walney Nature Reserve near Barrow-in-Furness, Cumbria is a nationally important 130 hectare coastal nature reserve. It hosts the largest mixed ground-nesting site for lesser black-back gulls and herring gulls in Europe and is a haven for birds, plants and small animals. The main part of this project involved the creation of new wildlife areas and wetland habitats for the incumbent bird, animal and plant species as well as stripping back the sand dunes back to their original state. The scope of the work included the excavation of over 2000cu.m of turf and topsoil which was then used to create 1.6m high soil bund walls around the site. 30 shallow wader scrapes have been constructed to provide wetland habitats for wading birds and marine plants, whilst over 1000m of natural timber fencing has been provided around the newly created wildlife area to better control the cattle and sheep which selectively graze the site. Little Woolden Moss is a Site of Special Scientific Interest (SSSI) covering around 114ha and is part of the much larger Chat Moss. It is one of the last remaining lowland raised peat bogs and features a number of rare species including the black darter dragonfly. Working with Lancashire Wildlife Trust, CCNW’s work involved felling & clearing large areas of young to mature trees with the purpose of improving the habitats available as part of a larger project to re-wet the mossland. Access was a significant problem so we had to carefully plan the work to get machinery and equipment on site. Nob End in Little Lever is a Site of Special Scientific Interest (SSSI) and a Local Nature Reserve (LNR). This 21 acre site was formerly a 19th century tip used for alkali by-products of the production of sodium carbonate (soda ash). It now supports a variety of chalk-loving vegetation and rare species, being Greater Manchester’s only natural limestone grassland. Following on from our work on the site in previous years, we were engaged by Bolton Council to restore the grasslands to Natural England’s specification via grass cutting and seed head from donor sites then relocating them to receptor areas. We also undertook further spraying to eradicate invasive weeds on site. Specialist plant, a flail mower scarifier collector, was used to harvest the seed heads and undertake grass cutting operations. The result is a much improved site with increased species diversity.